Two good quality reverbs that pay more than a passing tribute to a couple of classic hardware units. Straightforward editing. Great sound. Wide range of possible treatments. Native Instruments is best known for its synth and sampler-based plug-ins. More recently, however, it's been making a more determined push into other manufacturers' territory with a range EQ and dynamics plug-ins falling very much into 'vintage emulation' territory. These include the Vintage Compressor and Premium Tube collections, both of which were developed with Sweden's Softube - a firm that specialises in software emulations of sought-after studio gear. The search for the perfect artificial reverberation is long, and littered with interesting ideas, false starts and some odd devices. In the analogue realm we have had echo chambers, reverb plates and springs, as well as some pre-digital experiments with analogue bucket- brigade delay lines. However, it was the arrival of fast, and relatively affordable, integrated circuits in the 1970s that swung everything in the direction of DSP. Lexicon was one of the first companies to produce a commercially viable digital reverb in the shape of the Model 224 in 1978. In the middle of the '80s it released the 480L, which can still be seen in many top studios. "They both consist of more than just plain Hall reverb algorithms - and ultimately reveal their origins in the Lexicon 224 and 480L "
In the last ten years we have seen the rise of convolution-based reverbs processors. These are snapshots of real spaces based on actual audio recording and analysis. However, it is important to note that certain aspect of algorithmic reverbs cannot be reliably captured using a conventional impulse response system. For example, the famous Lexicon Random Hall algorithm uses modulation (to subtly alter pitch) that contributes to its tonal characteristics in a big way, but that cannot be distilled in IR form. This could be part of the reason for a resurgence in plug-in algorithmic reverbs, especially those of the emulated variety. This is especially noticeable in relation to Lexicon. The company has released its own in the shape of the PCM Native Reverb Bundle, and Universal Audio produced an officially sanctioned version of the classic Lexicon 224 hardware, which attempts to emulate the full range of quirks, noise, limitations, and sonic artefact of the original, and much-loved unit. NI's Reverb Classics bundle consists of the enigmatically-named RC 24 and RC 48 plug-ins, which are also available separately. It calls RC 24 a 'Character Studio Hall' and RC 48 a 'Royal Studio Hall'. Despite this, they both consist of more than just plain Hall reverb algorithms - and ultimately reveal their origins in the Lexicon 224 and 480L mentioned above. NI (and Softube) have chosen to focus only in a subset of all the algorithms available in the original units - so we get Room, Small Hall and Large Hall (with Dark and Bright variants) in the 24, and Hall and Random Hall in the 48. There is also little hiding these plug-in's origins in editing terms, as many of the parameters have the same name as the Lexicon originals. The RC 24 certainly captures something of the character of the Lexicon 224 on which it is based. We're suckers for the overly-modulated reverb tails possible with the original, and this plug-in creates these very well. "A nice bonus in both RCs is the Spectrum section - a guide to the reverb's frequency characteristics"
It also handles the smaller and more subtle treatments well, though in terms of exactly recreating the original, the UAD 224 plug-in comes closer, being almost obsessive in its approach. This is perhaps an unfair comparison, however, as their respective prices are quite different, and NI do not make any overt claims about authenticity. A better comparison might be Valhalla DSP's ValhallaVintageVerb, which at $50 is a cheaper option still. The RC 48 offers a slightly different array of parameters to the 24, reflecting its later origins, but again there is no disguising its resemblance to the original Lexicon 480L. This is a very nice reverb in its own right, and would suit all kinds of material. It is perhaps the more flexible plug-in of two due the addition of its Pre Echoes section, which is in essence a series of customisable 'early reflections'. It's closest competition is Relab's highly regraded LX48, but these start at $199 for a single algorithm version, and a little steeper $399 if you want the lot. A nice bonus in both RCs is found in the Spectrum section which provides a guide to the reverb's frequency characteristics over time. This can also be switched to provide real-time analysis based on the input signal. 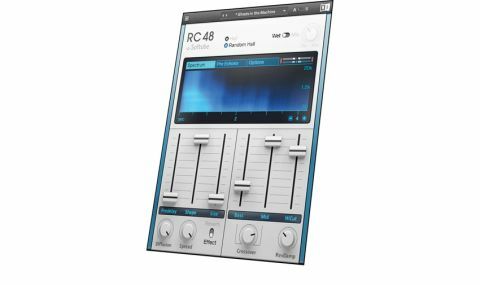 Both the RC 24 and 48 allow you to make the sound truer to the original units (theoretically of a lower quality) by enabling the Quantisation Noise setting in the Options tab, though we would have liked to have this, and some other less visible parameters, accessible from the main (front) panel. Despite this, editing is quite straightforward, with the front panel fitting somewhere between Softube's own TSAR-1 reverb and Lexicon's LARC hardware controller. Native Instruments and Softube should be congratulated for producing a good value bundle. This writer can certainly see himself working with them on mixes in the future.